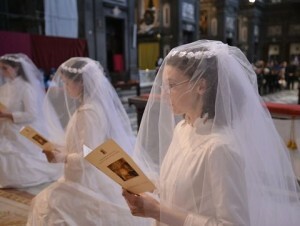 (Florence) on the 19th of March, the feast of St. Joseph, the investiture of five sisters of the traditional Order of the Adoration Sisters of the Sacred Heart of Jesus Christ took place in Florence. The Order was founded in 2001 in Tyrol and is the female branch of the Institute of Christ the King and High Priest. In 2004 they moved to Italy, where the Archbishop of Florence, Cardinal Ennio Antonelli solemnly vested the first three sisters. Today, the order has 25 religious sisters and is considering its first daughter foundation in the United States. In 2008 it was commissioned by Pope Benedict XVI., recognized canonically as a society of apostolic life of pontifical right. The monastery of the contemplative order is located near the General House and Theological Seminary of the Institute of Christ the King and High Priest in Gricigliano in Tuscany. The Women’s Order like the Priestly Institute are founded in the tradition of St. Francis de Sales and celebrate the Divine Liturgy in the Extraordinary Form of the Roman Rite. The Order of the Adoration Sisters of the Royal Heart of Jesus Christ, whose motto is In Corde Regni's (In the heart of the king), is consecrated to the Immaculate Virgin Mother of God. The ceremony in the Ancient Rite was celebrated by retired Auxiliary Bishop of Fiesole, Bishop Luciano Giovannetti.